It's a moment some university officials wait for with bated breath. U.S. News and World Report released their annual college rankings today. The nation's top three schools are Harvard, Princeton and Yale -- we know, you're shocked. But how did local schools stack up on the list of Best National Universities? But don't worry, Colonials, life in Foggy Bottom does beat Georgetown in one way -- OK, or two ways if you count last winter's showdown in the Snowdome of Doom. 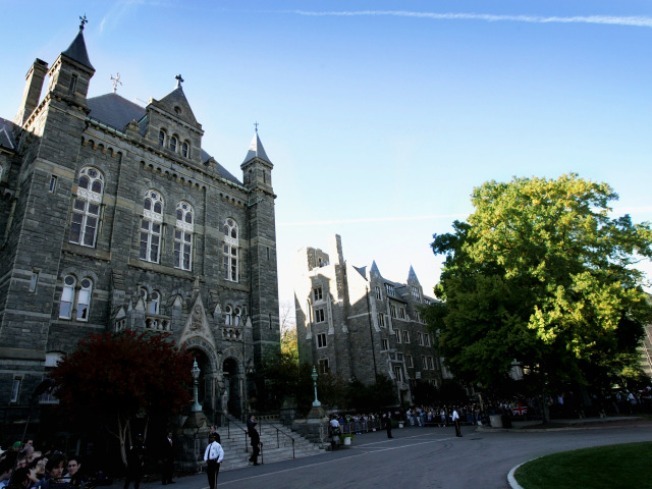 Its tuition and fees come in at $41,242, roughly a thousand dollars more than you'd spend as a Hoya. We know, it's not necessarily the best thing to win, but there you have it. As for other District colleges, American University ranked as #79, Howard at #104, and Catholic University of America at #120. And Howard came in second on the list of Historically Black Colleges and Universities. It lost out only to Spelman College in Atlanta. What about our neighbors outside the District? University of Maryland at College Park hit #56, and George Mason is down at #143. The rankings combine weighted factors such as faculty resources, student selectivity, undergraduate academic reputation and graduation rate performance -- as well as what U.S. News calls "up to 16 indicators of academic excellence." "Certainly, the host of intangibles that make up the college experience can't simply be measured by a series of data points," U.S. News and World Report said. We think that means they don't take into account how many Starbucks locations they have on campus. Otherwise, we're pretty sure a local school could be #1. GW, we're looking at you.